The arid hillside and the plains in the distance of the present watercolour suggest an Italian landscape and can be compared to a watercolour of the Euganean hills in the Veneto, in the Victoria & Albert Museum, From Mirabella, the Villa of Count Algarotti in the Euganean Hills (Walpole Society XXIII, pl. 21). This watercolour was executed from a sketch dated 19 June 1782 (see Sotheby's, 29 November 1973, Seven Sketchbooks by John Robert Cozens formerly in the collection of William Beckford, vol. I, no. 22). Other sketches from the collection, now in the Whitworth Art Gallery, Manchester also help to support this identification, see Sotheby's, vol. I, nos. 19 and 24. 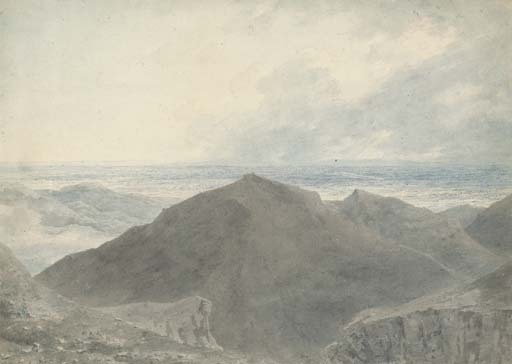 The present watercolour is also similar in scale to a landscape in the Victoria and Albert Museum entitled Ober Hasli Valley from the south east, see Kim Sloan, Alexander and John Robert Cozens The Poetry of Landscape, London and New Haven, 1986, p. 120, pl. 134. The plain beneath the hills in the present watercolour does however appear to open up more than in the Ober Hasli example. The mood however can be compared. In both watercolours the landscape is very dramatic and in the present example Cozens emphasizes the scale and grandeur of the natural forms by placing a tiny vulnerable human figure lower left. We are grateful to Tim Wilcox for suggesting that this view may depict the countryside around Naples (for examples see Cozens's sketchbooks vol. IV/15 and vol. V/19).